Sometimes the winter months seem like they will never end. That initial delight when the first snowflakes of the season arrive can turn into a cold and dark dread of winter's final days. Even my creative spirit at this time of year can feel sluggish as if it was laden down with ice crystals. 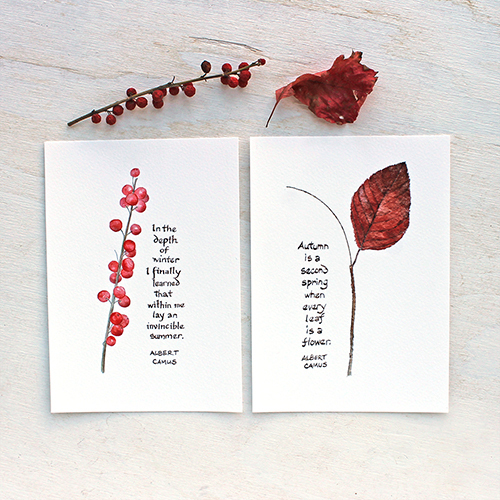 In November, a lovely customer ordered my Autumn Leaf print with the Albert Camus quote: "Autumn is a second spring when every leaf is a flower". She contacted me once she had received her order and asked if I knew of the beautiful winter quote by Camus. I didn't and what a beauty it is: "In the depth of winter I finally learned that within me lay an invincible summer". Isn't that gorgeous? Quite beyond enduring unpleasant weather and dragging seasons, it speaks to the strength that we can find inside ourselves when life is difficult. She said she would be interested in a companion print with the winter quote and had a wonderful idea of what to include with it. She suggested winterberry also known as Ilex verticillata. Do you know it? It's a beautiful shrub--a species of holly native to parts of North America. 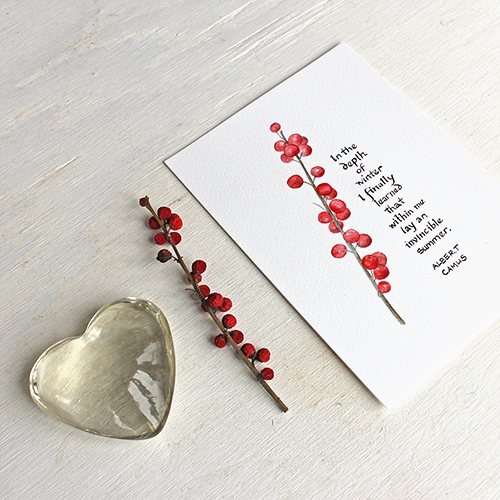 When the rest of nature is brown, grey or covered with snow, winterberry sports beautiful bright red berries. While I wasn't able to find winterberry in my local forest, I did find branches of it at a nearby garden centre. 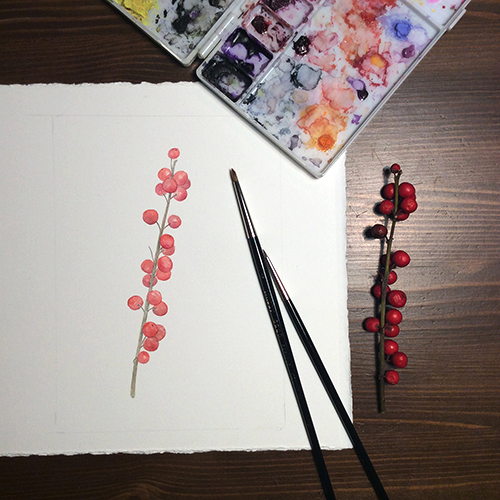 I absolutely loved painting the berries. A greater challenge for me was creating the lettering in watercolour to match the quote I had done for the autumn leaf image. Watercolour paint is capricious. Hand lettering with a small paintbrush is not like using a computer font that remains the same each time you use it, although in the middle of this project I sort of wished it was! I did so many tries before finally coming up with a version that was similar in weight and tone to the previous quote. 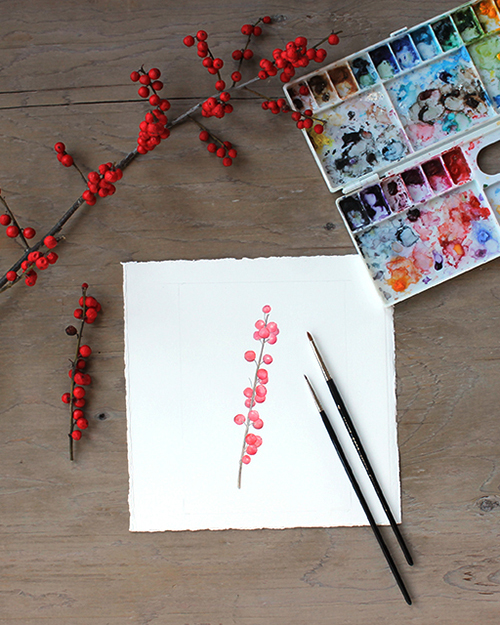 I am happy to say that my winterberry print is now available in my shop, on its own or coupled with the autumn leaf print. 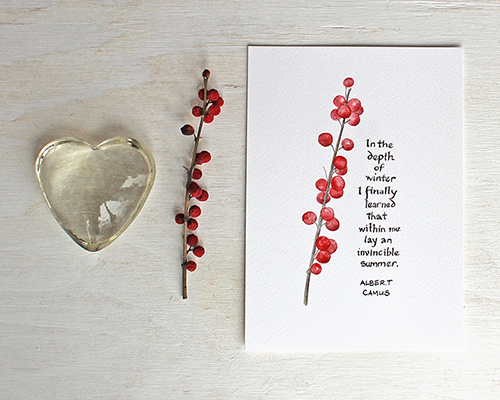 Thank you to my lovely customer and Albert Camus for the wonderful winter inspiration! Here is the painting I have been working on the past few days. I think it's finished now. This sweet bird visited our backyard a few years ago. I didn't even know what kind of bird it was at the time. It looked to me like a cross between a large sparrow and a bunny. So fluffy! 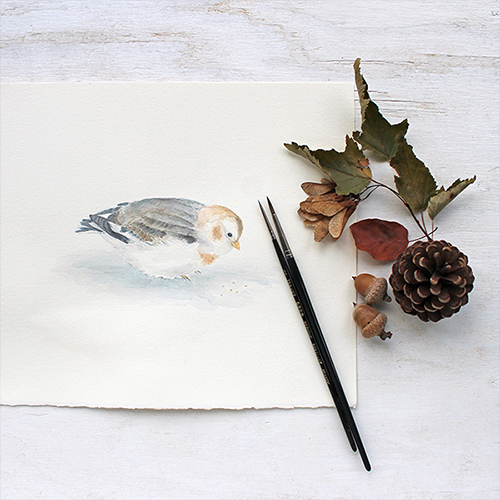 I looked it up and found that it was a snow bunting. I'm glad it stayed long enough for me to take a few photos of him. I did a previous painting of him but I like this one much more. I hope to have prints and cards available with this image in my shop in the next week or so. I love birds and have always fed them in our backyard. Having a garden that welcomes wildlife is important to me. I also wanted Emma and Chloé to learn about nature through our garden. From when they were toddlers, I kept bird, caterpillar and butterfly guides near our back door so we could identify our garden visitors. Among the birds that have visited our yard are sparrows (many, many sparrows), chickadees, cardinals, blue jays, juncos, robins, swallows, mourning doves, cedar waxwings, hummingbirds, house finches, goldfinches and woodpeckers. We've had rare visits by a kingfisher, a hawk and a ruffed grouse. Plus the sweet snow bunting. We have been in our current house for over 16 years. It was a new neighbourhood when we moved in so there were very few trees initially, which also meant that there weren't any squirrels. But there are now! The trees have matured. Now my bird seed isn't just attracting my feathered friends, it is attracting squirrels as well...which would be fine except for Meeko. Meeko is calm and accepting when birds are at our feeders. But squirrels? Oh my. He gets riled up, wants to chase them and he barks...a lot. I try to keep him quiet for the sake of our neighbours and our own sanity but it's hard to do. Last week, Chloé was studying for exams and Meeko was barking incessantly at the squirrels. She suggested that maybe I need to stop feeding the birds or to find another place for the feeder that is not visible from the house. That is such a hard thought for me although she may be right. I'm trying to think of alternate solutions. I thought of placing food on the ground somewhere to divert the squirrels' attention. I've even thought of placing paper at Meeko's eye level on the back door so he can't see them from inside. If you have a brilliant idea, let me know! On another topic, I have a few of my prints on sale currently! 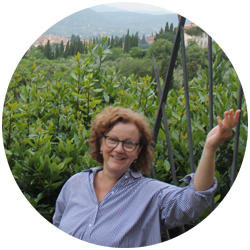 You can have a look at them here. I've been working on my shop a lot these past few weeks. I now have my art organized by category and theme. I hope it makes browsing more efficient and interesting.